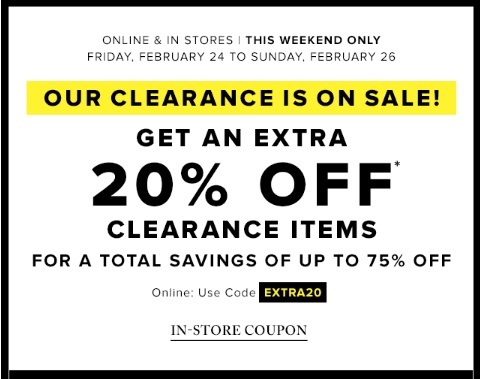 Hudson's Bay is offering an extra 20% off on clearance items for a total savings of up to 75% off on women's and men's fashion, women's accessories, intimates, watches and fashion jewellery. Offer is valid online and in-store from Friday, February 24-Sunday, February 26, 2017. Shopping in-store? Click here for the in-store coupon offer.